Let’s take a moment to fact-check the statements in this meme. The King James Version of the New Testament was completed in 1611 by 8 members of the Church of England. False. There were six panels of scholars who worked on the KJV: three for the Old Testament, two for the New, and one for the Apocrypha (for those who didn’t know, the Apocrypha was included in the KJV until it was dropped in the 1800s). In total, forty-four leading scholars worked on the version. The chuch affiliation of these men included both Anglican and Puritan. There were (and still are) no original texts to translate. True, but misleading. The basic intent behind this statement is to imply that a lack of original texts means that Bible translations are prone to errors. However, we must qualify this by saying that, to anyone’s knowledge, we have no original documents (autographs) of any composition written in the ancient world. The KJV is based on the Textus Receptus, a family of manuscripts dating back to the Medieval period. More modern versions use texts that date back as early as the early second century. These two families of manuscripts are very similar with only slight differences. There are over 8,000 of these old manuscripts, with no two alike. Partially true, but misleading. There are over 5,800 manuscripts, not 8,000. The inflated number could be a mistake stemming from the author’s basic unfamiliarity with the subject. And it is true that the manuscripts do differ in very minor respects, although this is far from what is implied by the phrase, “no two are alike.” There are many different kinds of textual variants, but only a rare few have any bearing whatsoever on scholars’ understanding of the text–and none of them affects any theological position. The creator of our meme obviously doesn’t know anything about the field of textual criticism. The King James translators used none of these, anyway. Instead, they edited previous translations to create a version their king and Parliament would approve. Mostly False. Whoever wrote this meme is unfamiliar with the Great Preface, which was included in the first editions of the KJV but was later dropped (it’s available online). This document makes it clear that the KJV was, in fact, more of a revision than a translation. 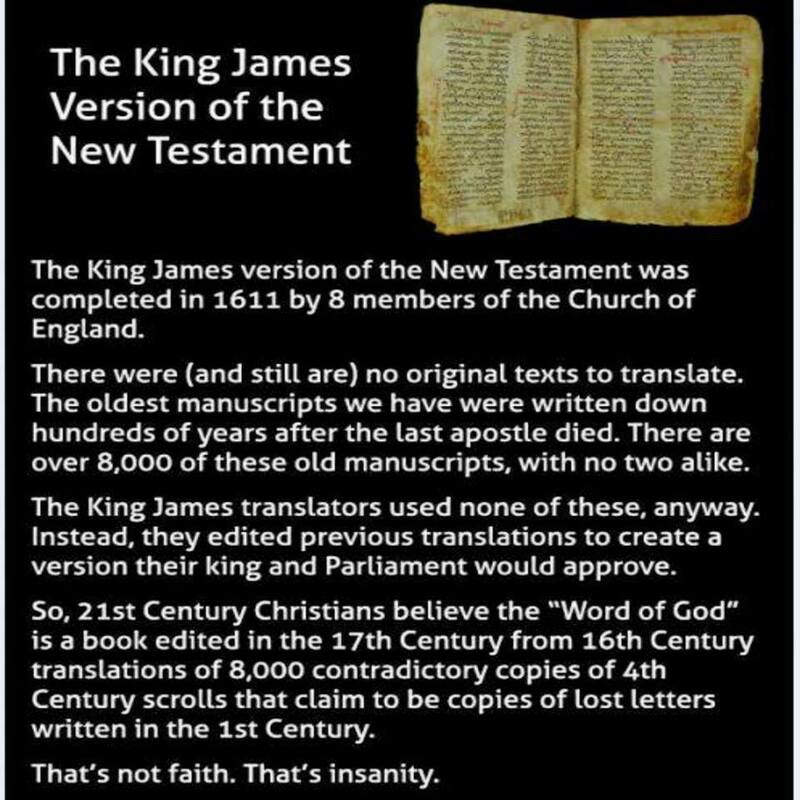 King James instructed the scholars working on the KJV to use earlier translations—specifically the Bishops Bible—as a guide but to make changes wherever the original language dictated. To determine the original wording as accurately as possible, the translators consulted numerous ancient versions in addition to the Hebrew and Greek texts available at the time. Many of the manuscripts available today were unknown at the time the KJV was produced. So, 21st Century Christians believe the “Word of God” is a book edited in the 17th Century from 16th Century translations of 8,000 contradictory copies of 4th century scrolls that claim to be copied of lost letters written in the 1st Century. False. There’s a lot to unpack here. No, Christians do not believe that the KJV is the “Word of God” in itself. It is only God’s Word in the sense that it accurately represents the original words of the biblical authors. And again, the 8,000 number is way off. As far as the “contradictory copies” comment goes, anyone who has spent any time studying the issue knows that the textual variants may include nothing more than a simple misspelled word, an accidental omission, or swapping two words (e.g., one text having “Jesus Christ” while another has “Christ Jesus”). The way some critics use the term contradiction seems to be, “any disagreement, no matter how slight or insignificant.” A true contradiction is where one statement stands in unmistakable opposition to another–something we don’t find among the biblical manuscripts. Finally, the date of “4th Century” is used for no apparent reason. There are manuscripts dating to the second and third century. What our critic may have done is used the date of the earliest complete version of the Bible, which is Codex Vaticanus (c. AD 325; then again, the creator called the texts “scrolls” when he should have said “codices”). We have to remember that even dating 230 years after the death of the last apostle, Vaticanus is still closer in time to the originals than virtually any other composition from the ancient world. The earliest copies of works by Plato, Aristotle, Homer, Julius Caesar and others often date 600-800 years—and some as much as 1,000 years or more—after their original date of composition. That makes the New Testament the best-attested document in antiquity – a fact of which our critic is completely unaware. We know that a position is weak when a person has to deliberately misrepresent the opposition, as has been done with this meme. It will no doubt get the applause its creator desired from those who share his beliefs. But it is a false portrait of actual scholarship. This meme reveals the heart of some who criticize Christianity. The characteristics of a person like this include a lack of accurate factual information, a willingness to caricature the opposition, reliance upon faulty arguments, and zero interest shown in learning anything about the issues raised. This blessed me. I still have some issues with the KJ but not with it as a whole. Click on my e-Business Card Below for more contact info. Also, please share it with your family and friends or let me know Of your thoughts, if you need prayer, Bible Study, etc. I only use the KJV and find no fault with it. Many have said the contrary to me, and they could provide NO examples of this. A recent post I made illustrates the #Hypocrisy of the KJV haters. Thought this was a very accurate and balanced post. There’s too little light on either the side of those who say the KJV is unreliable or those who go to the other extreme and insist that only the KJV is God’s word for the English-speaking people.